Just yesterday, Hugh Jackman teased that news about the next Wolverine movie would be coming soon. He did not disappoint. After months of speculation, Jackman has revealed the official title of his third solo Wolverine movie, which will be his final performance as the character, and it isn’t the rumored Wolverine: Weapon X.
Jackman tweeted out a photo of a poster featuring the title Logan and the film’s March 3, 2017, release date. 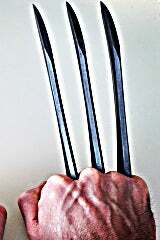 The poster also shows Wolverine's hand, claws protruding, holding the hand of a child. 20th Century Fox has not officially stated much of anything about the film’s plot, but if the rumors are to be believed then that hand likely belongs to X-23, Wolverine’s fierce female clone. The title itself rings a couple of bells from the character’s history. Logan is obviously Wolverine’s name (the one he took after leaving Weapon X anyway. It was later revealed that his real name is James Howlett, but Logan remains one of his better-known aliases). There was also a three-issue Logan miniseries released by Marvel in 2008, written by Brian K. Vaughan and illustrated by Eduardo Risso. Portions of that story, which was a flashback to Logan’s early days in Japan, were used in The Wolverine, and so it is probably not a core inspiration for Logan the film. Instead, the Logan title may be a shortening of “Old Man Logan,” the Mark Millar and Steve McNiven story that has long been rumored to serve as inspiration for Jackman’s last Wolverine adventure. Logan is directed by The Wolverine director James Mangold and stars Hugh Jackman, Patrick Stewart, Boyd Holbrook, Richard E. Grant, Stephen Merchant, Eriq La Salle and Elise Neal. MORE: Be sure to get all the lastest on Wolverine 3 / Logan as news is breaking fast! Wolverine 3 Director Confirms Title and Reveals Script / 5 Things We Want to see in Logan / 5 Things We Won't see in Logan / Who is the child on the Logan Poster? Logan hits theaters on March 3, 2017, followed by Deadpool 2 on January 12, 2018. Movie versions of Gambit, New Mutants and X-Force are still being developed.